Devote less time keeping up with your documents and forms—and more time to other tasks. Easily scan, process, and export your client files and data with a complete solution from Sekonic’s SR-55D Scanner and DataCap’s TestAnyTime Software. DataCap and Sekonic assembled this ultimate data collection bundle with the objective to support and enhance all your data capture needs. Due to its compact size and portability the SR-55D takes a matter of seconds to setup and you’re ready to use. The same can be said to TestAnyTime, with a user-friendly interface and simple layout design, it is straightforward to setup and know what you are doing. This bundle provides users with the choice of using traditional pre-print OMR forms or simply creating your own forms. TestAnyTime and SR-55D integration allows for this flexibility and technology. Enjoy instant access to your documents and files—even when you’re away from the desk. Files and images can be shared through local networks and can be scanned instantly or later. In addition regardless if you are a basic user or an advanced user, TestAnyTime is packed with a range of functionality and features for your data capture tasks. SR-55D integrated with TestAnyTime offers unparalleled scanning and processing performance, which reduces manual entry and validation. 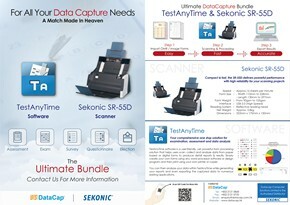 As partners, Sekonic and DataCap have worked together for almost two decades in the data capture industry. Sekonic’s manufacturing experience in scanning hardware is one of the best in the market, along with DataCap’s own developed TestAnyTime software we believe that you can have confidence; this integrated solution will enable you to get your data collection tasks done to the highest of standards.